I am beyond thrilled to welcome Maggie Robinson to my blog today. 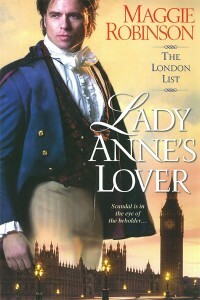 She is currently promoting two books: In the Arms of the Heiress, the first book in her new Ladies Unlaced series and Lady Anne's Lover, the final installment in her The London List series. The year had been long, and I was irritable. My husband John was even more irritable -- as a high school principal, he didn’t have the summer off, and his year had been way longer than mine. We got into some silly argument, and I was so mad I went upstairs to the guest bedroom, grumbling about the stubborn, impossible man I had married so many decades ago. And I couldn’t sleep. Why couldn’t he understand what I meant? There was such a ridiculous Mars-Venus thing going on, I just wanted to strangle him. But you kind of get in trouble for that, so I stewed and rolled around in the bed until I finally got up and sat down at our brand-new computer. Ten years ago, I was not especially computer-savvy, and as the mother of four kids, I hardly ever got a chance to be near one while they were still home typing term papers and playing games. It was a wonder I knew where the on button was. But I found it, and the writing program. By golly, I was going to make a man behave, even if I had to make one up to do so. And so began my first “book,” which turned out to be only 20,000 words and featured an amnesiac bluestocking who is rescued from a brothel by my impossibly perfect hero. Needless to say, this story will never, ever see the light of day. So I guess I was inspired by my annoying husband. Once I started writing, I couldn’t stop. I totally had no idea what I was doing, but John encouraged me (we were talking again, LOL) and I fiddled around for a few years during school vacations with various things that made me laugh and cry and tear out my hair. Eventually, I started to get serious, found great critique partners and writing friends and won a few contests. Then in August 2008 I got my fabulous agent Laura Bradford, who helped me sell my first book in April 2009. Now I live to match two imperfect fictional people together and see how love transforms and heals. Love really does save the world, I think. When you pick up a romance novel, you know no matter how much the author has tortured the characters, there will be a happy ending. Happy endings are sometimes elusive in real life, and how comforting to know you can find one within the pages of a book. Independent heiress Louisa Stratton is going home to Rosemont for the holidays, and at the family’s request, she’s bringing her new husband—Maximillian Norwich, art connoisseur and artful lover, the man she’s written of so glowingly. There’s one hitch—he doesn’t exist. Louisa needs a fake husband, and fast, to make the proper impression. Charles Cooper, captain of the Boer War and far from silver spoons or gilded cages, is so hard up that even this crazy scheme appeals to him. It’s only thirty days, not till death do them part. What’s so difficult about impersonating a husband, even if he doesn’t know a Rembrandt from a Rousseau? The true difficulty is keeping his hands off Louisa once there’s nobody around to see their ruse. And then there’s the small problem of someone at Rosemont trying to kill him. Keeping his wits about him and protecting Louisa brings out the honor he thought he’d left on the battlefield. 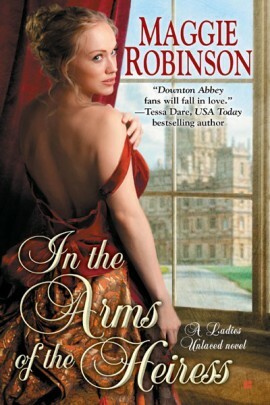 But when Louisa tries to protect him, Charles knows he’s found a way to face his future—in the arms of his heiress. Louisa settled into the crook of his arm, her body close and hot against his. He imagined she was imprinting him with the pattern from her figured silk robe, branding him with vines and leaves. Charles refused to let himself look down at the creamy skin of her décolletage or the innocent hand that was placed across his chest. She had capable hands, he recalled, hands that moved expressively as she chattered on, hands that could light stoves and shoot guns and drive cars. And drive a man wild with their light touch upon his skin. He had only himself to blame for this torture. It might be better to go back to his room and wait to be clubbed to death. He gave a grunt that could be interpreted any which way. He should feign sleep, begin to snore so she would stop trying to talk to him. No such luck. Charles had no answer for her. His throat was a desert and his tongue glued to the roof of his mouth. Charles choked. She was babbling. Well, she’d had a shock, although it should be he who was incoherent after getting whacked on the onion. “I thought you said I was safe from you.” The damn girl gave him a look that said she didn’t want to be safe. “I lied.” By God, he had lied. He was as hard as a rock. “Acted as man and wife. Just for tonight. Who knows what tomorrow will bring? We may be murdered in our sleep.” Louisa gave him a dazzling smile, as if the prospect of future death was quite delightful. Gareth’s head spun, and not from his unfinished breakfast ale. Of course she wasn’t a housekeeper—her skin was fine as porcelain, her skill in the kitchen execrable. True, she could clean, but anyone could grab a rag and make a difference to his hovel. She was speaking gibberish. Was this some sort of delayed alcoholic delusion? He shook his head to clear it. “I --” He was about to deny the undeniable. What she said was true. He’d just passed the worst year of his life. With no honor and very little wit. “Not really.” The Reverend Ian Morgan thought Gareth was Satan incarnate. A heathen. An inebriate. An adulterer. A murderer. This was becoming more and more absurd. He hadn’t even known Mrs. Mont a full week. He didn’t even know her first name. “We’ll discuss it now, I think.” He patted the bed. I absolutely love your novels and am so excited to get and read these latest ones. Congratulations on your stubbornness. You realized what you wanted and you went for it. Good for you! All the best!